Great Smoky Mountains Association is a non-profit organization founded in 1953 to provide educational services and programs to Great Smoky Mountains National Park. 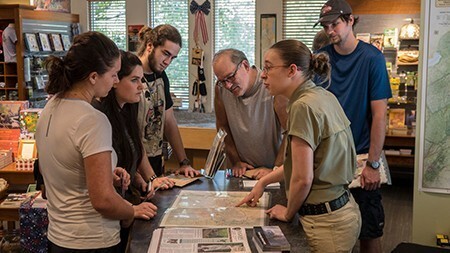 We're looking for employees for our visitor center store locations who love the park and enjoy helping our 10 million visitors each year experience the Smokies to the fullest. Please make sure to review the qualifications for the position. You will then need to download and fill out the application. Submit your completed application, resume, and cover letter by emailing our HR department HERE. Email is preferred. Join Our Team! Make someone's visit to the Smokies special, while supporting the important work our organization does every day to benefit this national park. Job Statement: Under general supervision, performs administrative and clerical duties in operation of sales outlet managed by the Great Smoky Mountains Association. Is responsible for assisting customers with purchases and inquiries about the Park and Association. Is responsible for providing interpretive assistance and assisting visitors with identification of indigenous wildlife, flora and fauna. Is responsible for sales transactions and for ensuring proper inventory of sales shelves. Duties: Operates computerized cash register to accept payment and make change for merchandise at sales outlet; assists customers with a selection of merchandise for purchase. Answering visitors' inquiries about programs of Association and National Parks Service, directions to points of interest within the region or National Park or identification of flora and fauna and wildlife; summons aid in cases emergency; refers inquiries to proper NPS or Association officials as necessary. Maintains shelf inventory of merchandise for sale; stocks shelves, brochure and leaflet dispensers, display tables, etc. ; obtains necessary items from the stock area. Collects and prepares records of money from brochure and leaflet dispensers. Operates video/audio player in sales area. Balances cash register drawer at the end of the day and makes deposits. Opens and closes sales outlet at prescribed times, securing sales outlet at end of work day. Assists with periodic inventories; may complete stock orders for warehouse delivery. Minimum training and experience: Graduation from high school and 1 to 2 years of experience in retail sales, or any equivalent combination of training and experience which provides the required skills, knowledge and abilities. Must have general knowledge of the programs, goals and objectives of the Great Smoky Mountains Association and the National Park Service. Required for all Positions: Please submit a completed job application, cover letter and current resume to Kelli Green, Human Resources, 865.436.7318 Ext. 228.